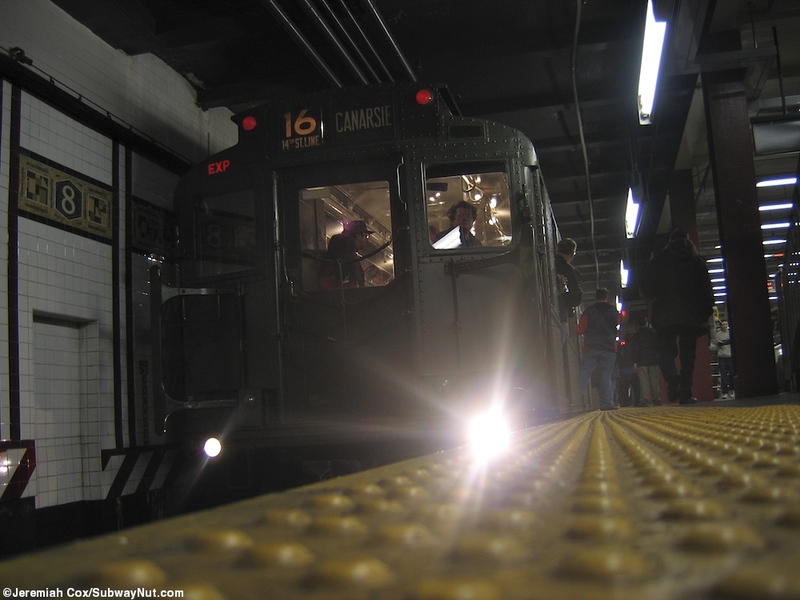 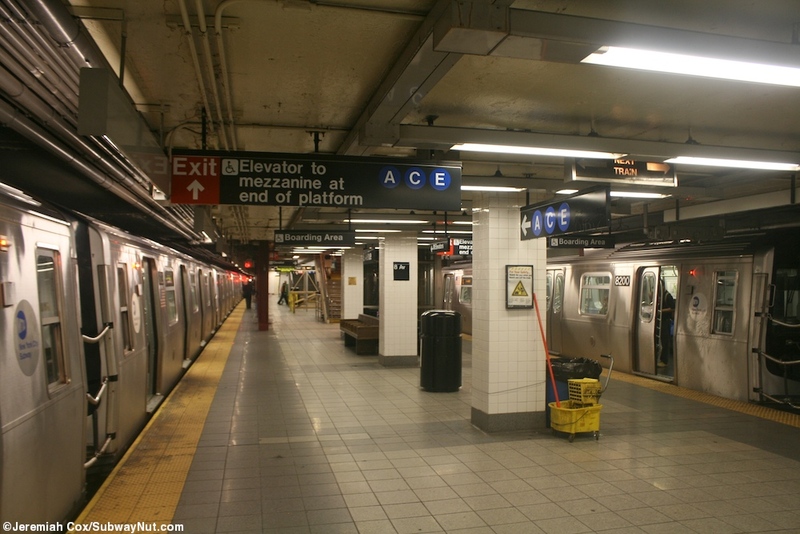 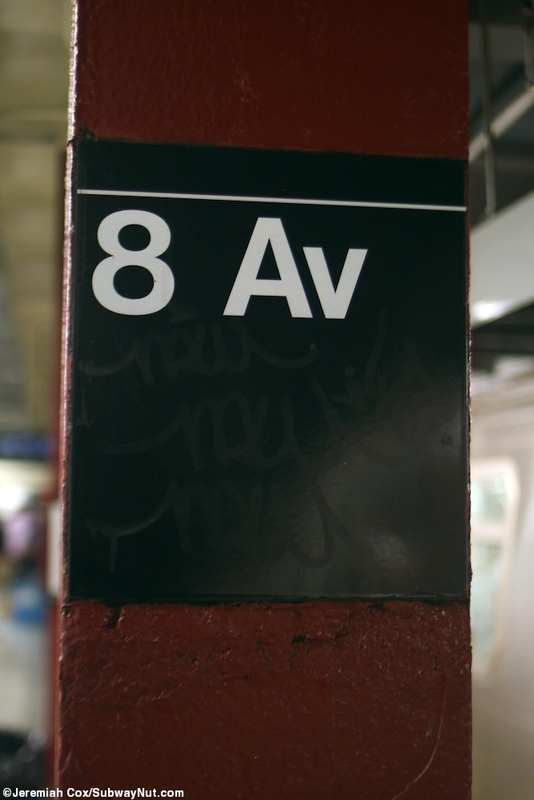 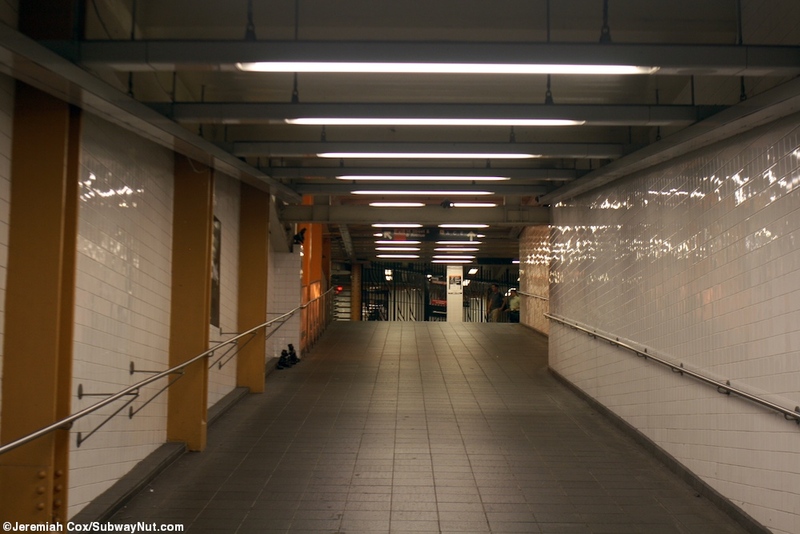 8 Avenue has a single island platform for terminating trains. 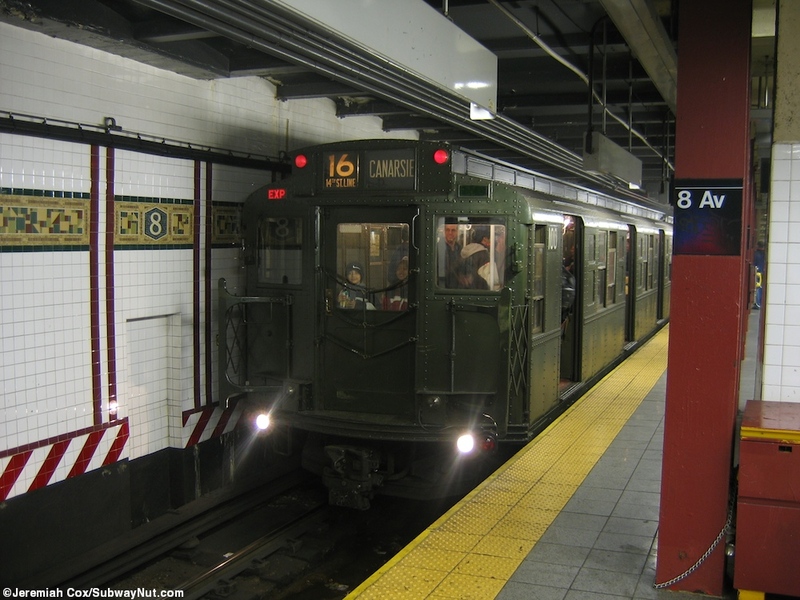 A cross-over switch just before the station and the tracks end in bumper blocks right along the platforms. 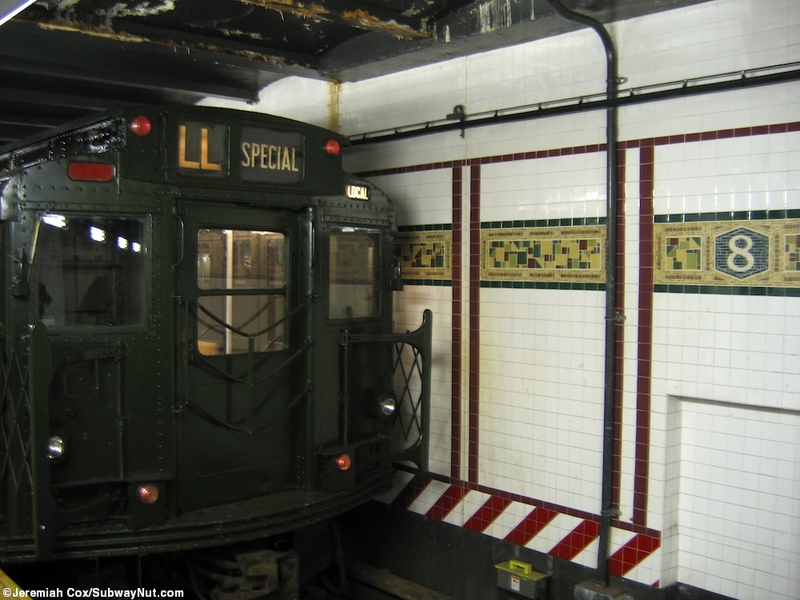 When the station was renovated in 1999 a replica Vickers trimline with little 8s on arrangement of various colors was installed. 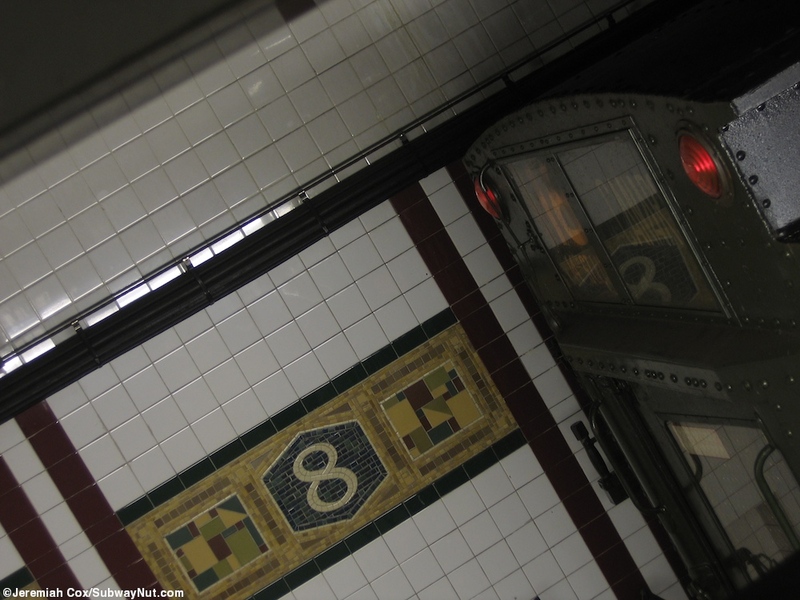 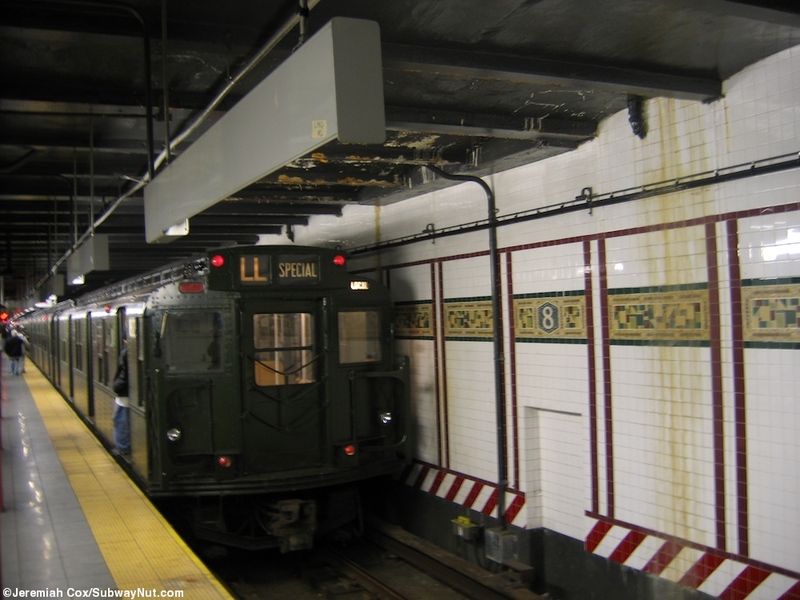 This is not original because the stop was built by the IND complete with a blue trimline with 8 TH Av in tile beneath (photo). 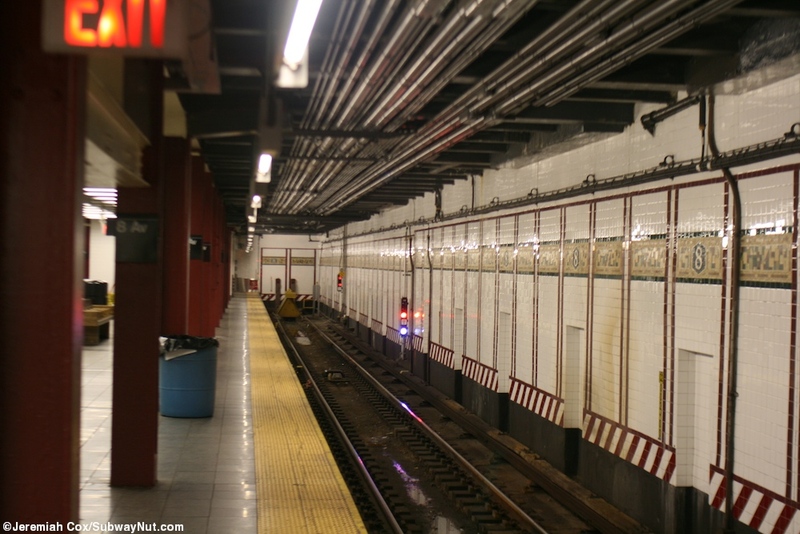 Along each track is a line of maroon columns. 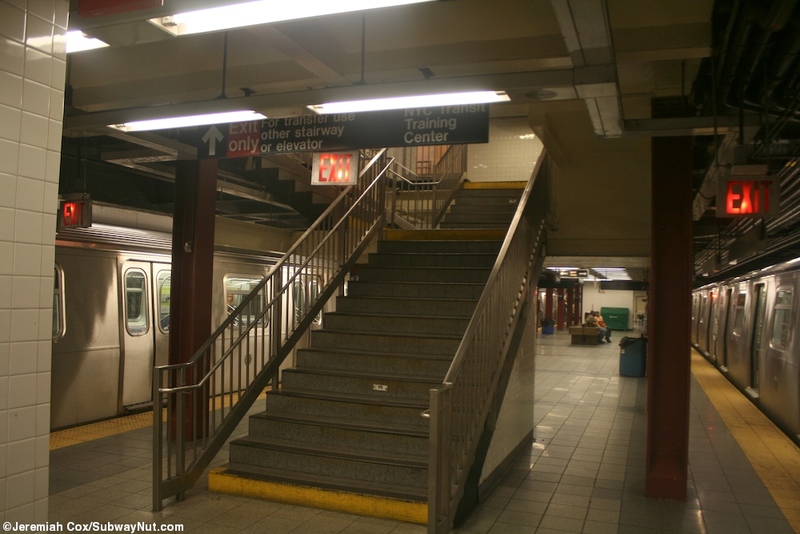 The stop has a collection of closed or never open to the public areas including more ramps that are still visible on a peephole from the existing ramp, this area is now used as the NYCT Training Center and signs in the station direct employees to it. 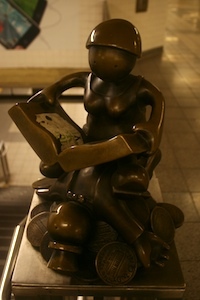 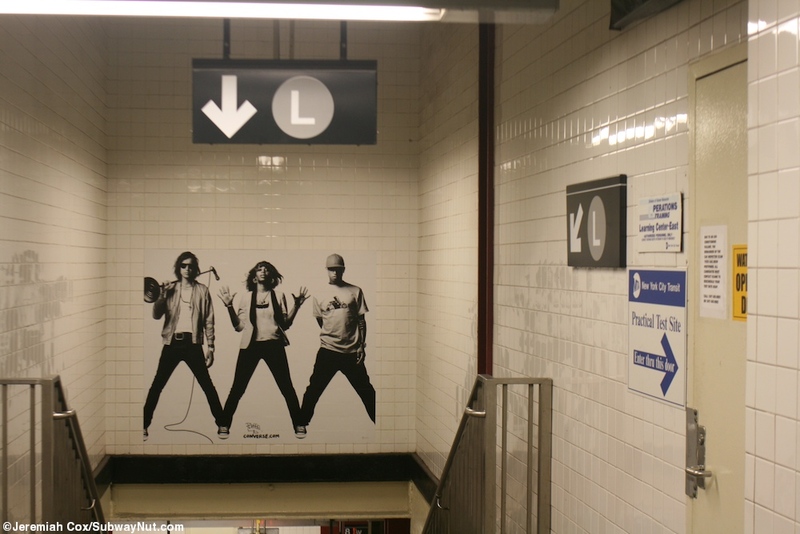 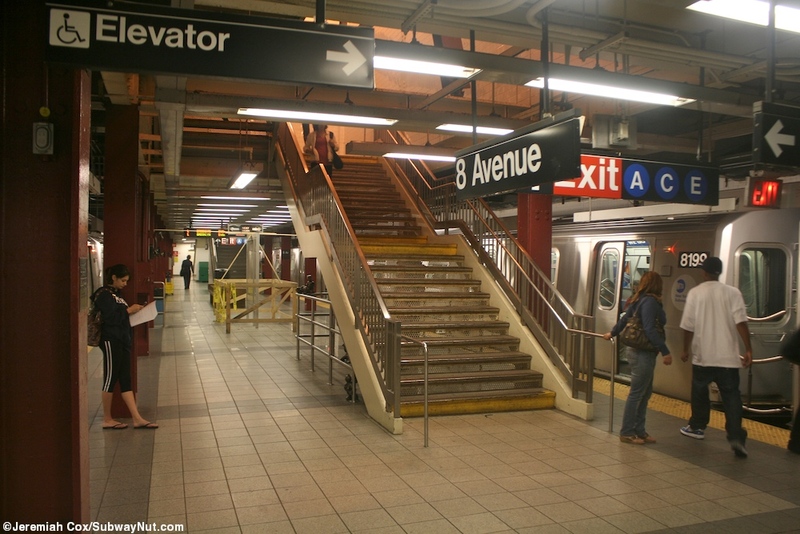 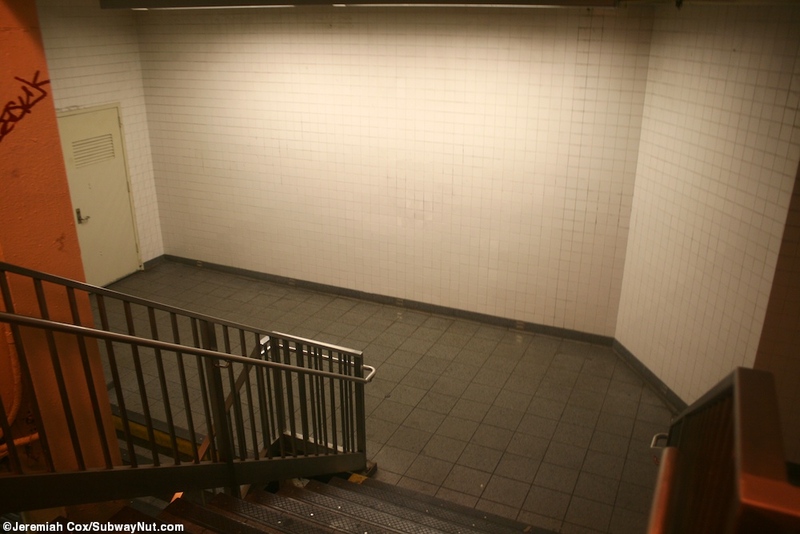 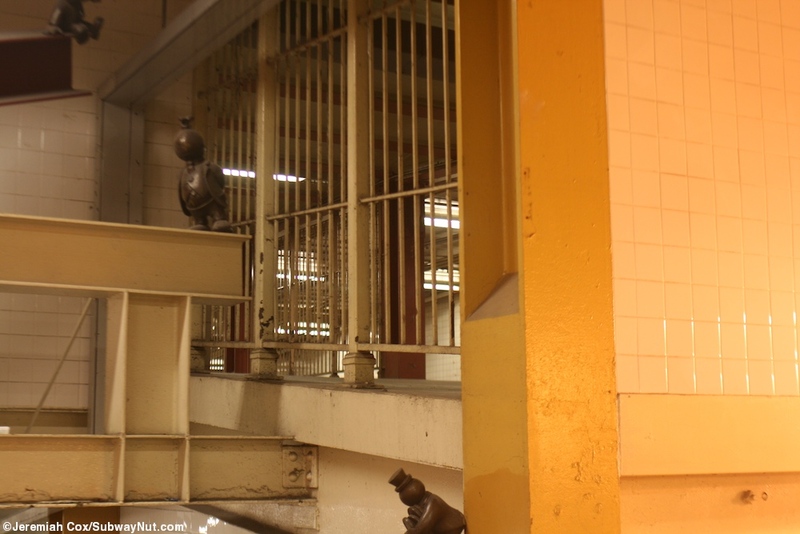 For access to the exits and transfers to the 8 Avenue subway trains, beginning near the eastern end of the platform there are two staircases that lead up to an intermediate mezzanine before they meet at a ramp continuing up to the large IND mezzanine, at the top of the mezzanine is another staircase down to the L platform and a staircase down, and then the platform elevator for the L train. 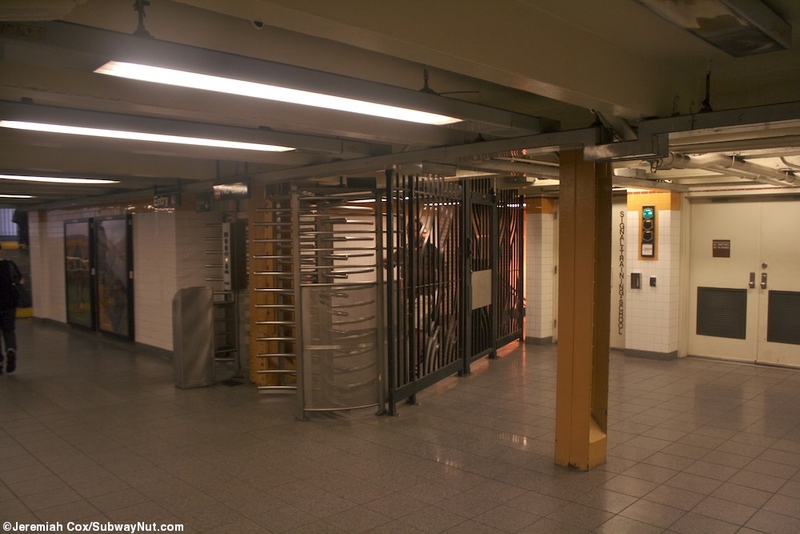 There is a bank of high turnstiles immediately that lead out to a passageway outside of fare control at the main station entrance. 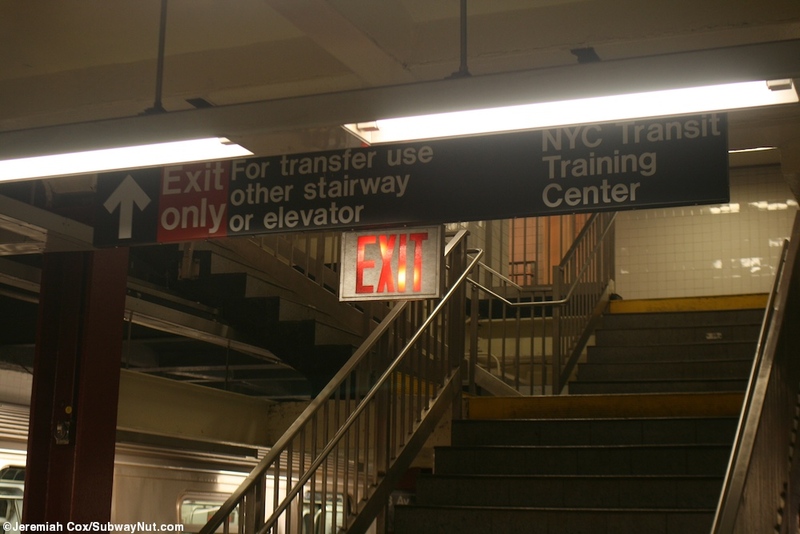 Continuing down the platform is final staircase that leads up to a network of 2 staircases (and passes dead-end staircases to the NYCT training center as signs direct) up to the its own high exit only and high entrance turnstile in the main entrance area beneath 14 Street and 8 Avenue, right next to signal school.